Like any interior door, you can install molding around a bifold door. The difference is, with a bifold door, you're not trying to hide any gaps between the door and the door frame, since bifold doors do not have door frames. Molding around a bifold door is purely decorative. Exact placement of the molding is important, since molding sticking into the opening can interfere with the functionality of the bifold door. Set a miter saw to a right-hand 45-degree angle cut. Cut approximately 1 inch off the left-hand side of a piece of baseboard molding. Measure the bifold door opening's width. Transfer this measurement to the baseboard you just cut, measuring from the left to the right. 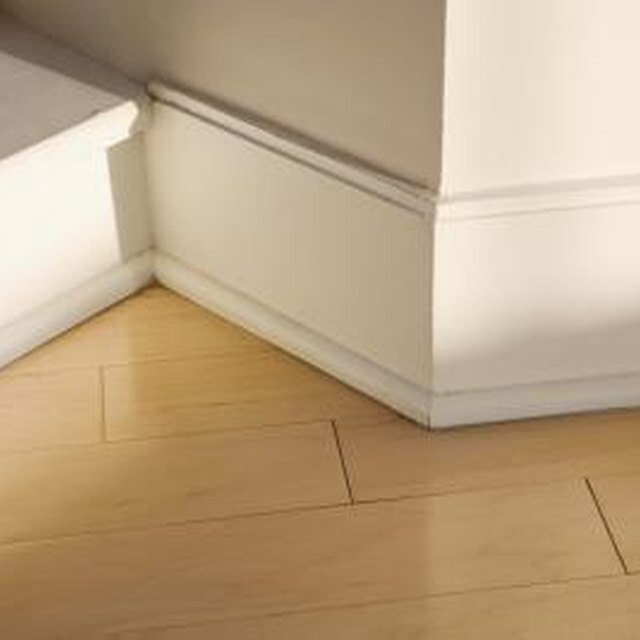 Move the miter saw to a left-hand 45-degree angle cut and cut the baseboard to the appropriate length. Lift the molding up over the bifold door opening. Hold a level over the molding and position it so it sits straight across the opening. Keep the molding's bottom edge even with the upper portion of the opening's bottom edge. Secure the molding in place with finishing nails and a pneumatic nail gun. Cut a 1-inch piece off the left end of a new piece of molding, with the miter saw still set at a left-hand 45-degree cut. Measure from the upper molding to the floor on the bifold door opening's right-hand side. Transfer this to the molding, measuring from the left to the right. Make a straight cut across the molding. Position the molding on the bifold door opening's right-hand side. Line up the molding's mitered end with the upper molding's mitered end. Hold a level against the molding and adjust it. Secure it in place with finishing nails. Set the miter saw to a right-hand 45-degree cut, and cut 1 inch off the end of a third piece of baseboard molding. Measure the height from the opening's upper molding to the floor, and then transfer it to the third piece of molding. Cut the molding, straight across, to the appropriate length. Position the third piece of molding against the bifold door opening's left-hand side. Line up the mitered end with the upper molding's mitered end. Hold a level against the molding and position it so it's plumb, then secure it in place with finishing nails.